The 2011 SEMA Show is just a day away, but before we start bringing you live coverage from Las Vegas we are bringing you a preview of some of the new parts that will be introduced. Manufacturers will be unveiling a wide range of parts from air intake systems, suspension components, transmission upgrades, shifters, fuel systems and more. 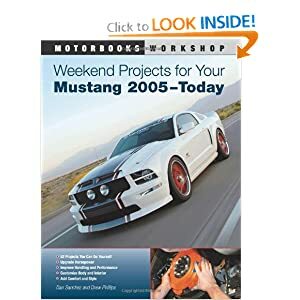 You can see all the new Mustang products from the 2011 SEMA show below, and be sure to check back over the next few days for the latest news and products. AEM’s Ford Mustang Performance Intake system is designed to increase horsepower and torque eliminating airflow restriction caused by factory air box system and filter. AEM induction increases power by reducing restriction in the inlet system and provides near ambient inlet air temperature. AEM has collaborated with K&N to introduce a new Dryflow® high performance air filter technology that does not require oil and is easy to clean. Complete drop-in fuel pump assembly for 2005-2010 Ford Mustang fuel tanks. Support over 1000 horsepower from a single fuel pump inside your factory tank. This suspension package replaces your 2011 Mustang factory components with coil over struts that allow ride height adjustments and “made-for-racing” caster-camber plates that are sure to please from show-time to go-time. Fits automatic V6/GT applications and features billet aluminum, CNC machined plate in anodized black finish with Hurst logo. Requires no console modification and includes polished, titanium anodized Hurst “Hard Drive” stick. A cast intake manifold for the 3V 4.6-liter V8 of the 2005-2010 Mustang GT. Strut Tower Caps machined from 6061-T6 Billet Aluminum and clear anodized for a great look. The set includes 10 caps to dress up both sides of the engine compartment. Precision Crafted High Performance 304 Stainless Steel Short-throw Shifter for 2011+ Mustang. Performance-calibrated mass air sensor for 2011-2012 Mustangs. Increased horsepower, mileage, and improved throttle response. Compatible with other performance upgrades. Replaces your vehicle’s restrictive factory air filter and intake housing to dramatically reduce intake restriction. More air means more usable power and acceleration. K&N’s molded intake tube and air box was designed to replace the restricted intake track. K&N’s intake will fit the vehicle using factory mounting points. Long Tube Headers precision crafted and dyno tested to deliver optimal performance from the 2011 Mustang GT 5.0. Part of a complete MBRP race package. Bolt-in rear coil-over kit is available in Single and Double Adjustable Configurations, along with multiple spring rate options depending on the application. The Tranzilla modifed Tremec Magnum 6 speed transmission fits Mustangs 2005-up, and the 2011 Getrag-equipped Mustang. Eliminates the stock two-piece drive shaft and the stock remote shifter. These Tri-Y Headers resemble traditional Tri-Y’s in appearance, with subtle changes to enhance fit and performance! Tubes are CNC mandrel bent, then carefully installed in our precision engineered welding jig for a perfect fit, and precision welded by a master craftsmen. A mirrored polished stainless steel sheet metal engine compartment dress up kit for the 2010 -2012 Ford Mustang Shelby GT 500. Designed for the unique requirements of 2012 Ford Mustangs, TCI StreetFighter Torque Converters are perfect for everything from stock to radically prepared street/race machines. Carbon fiber grille for the 2010+ Mustang. This is a show-piece quality finished with UV clear coat protection. Installation is an ease. Carbon fiber hood grill insert for the 2010+ Shelby GT500 that will make your stock hood stand out in crowd. Clear coat finished protects from UV. Stainless mesh grill embed. Installation is an ease. Replacement pieces for the stock engine cover and ignition coil covers. A plenum cover for the 2005-2010 Mustang GT that mimics the styling of 2011+ version. Whiteline tubular strut tower braces reduce chassis flex while improving traction in the turns, increasing turn-in response, and reducing understeer. Wiseco is releasing new forged pistons for the 2011 5.0 V8 Ford engine. They are available in 9.5:1 and 11.0:1 configurations. The ZEX Blackout Kit for the 2012 Mustang is designed specifically for street/strip and all out drag race, stock or modified, 2012 Mustang applications.